Institute for the Future (IFTF) is a non profit organization that helps companies understand and plan for the future. Its frameworks and reports aim to demystify complex topics and enable people to think strategically and creatively about how to design organizations that thrive in the future. Biodiversity is a key part of its future foresight work, because it is critical to designing for resilient futures. 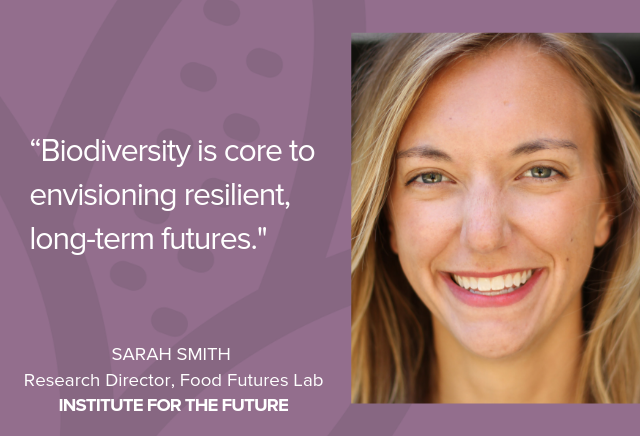 Below, Sarah Smith, research director of IFTF’s Food Futures Lab, talks to me about IFTF’s research envisioning future scenarios and looking at how biodiversity creates new opportunities for human and planetary health, flavor and business. She also highlights a number of great resources and initiatives, like The Earth Bank of Codes, an open platform aiming to map the genetic sequences of all living things, apply AI and systems analytics for novel discoveries and record the provenance of biological IP assets. Sarah Smith: At Institute for the Future (IFTF) we see biodiversity — the variety and variability of life on earth — as an essential element of imagining and designing for resilient futures. Thriving ecosystems are a necessary precursor for supporting human life on this planet. Focusing on them is becoming increasingly urgent as we experience the impacts of anthropogenic climate-change. This biological definition of biodiversity overlaps with many of the core reasons it’s so important to think strategically and imaginatively about a wide range of future possibilities (at IFTF we call this a foresight mindset). Just as a biodiversity rich ecosystem is better able to resiliently recover from disruptions, a diverse exploration of future possibilities makes us better able to see patterns and design resilient responses in our human systems. For example, by not simply assuming the future will be an extrapolation of the present, but instead systematically considering scenarios of growth, constraint, collapse, and transformation, we are increasing the variety and variability of possible futures, and can assess those to make better decisions in the present. SS: IFTF’s frameworks and reports are designed to create clarity around complex topics and enable people to think strategically and creatively about how their actions today can lead to building more resilient futures. They also push people to take a more systems-level perspective in order to inspire systems-level change. We work with stakeholders around the world across the food industry — multinational corporations, governments, foundations, and entrepreneurs — to identify strategic opportunities that promote a collective, long-term self-interest for people and the planet. Biodiversity is core to envisioning resilient, long-term futures. Our Food Futures Lab report, Food Innovation: Recipes for the Next Decade starts with a chapter called “Scalable Biodiversity,” which looks at how promoting biodiversity at the macroscale (reviving the consumption of more diverse plant and animal species) can also lead to improved biodiversity at the micro scale (beneficial bacteria and microorganisms in the human gut and in the soil). Download the full report to read three forecasts about how Scalable Biodiversity creates new opportunities for human health, delicious flavor, and long-term planetary resilience. To illustrate a possible experience in that future, we created an Artifact From The Future (part of a whole series of them, which you can see here). 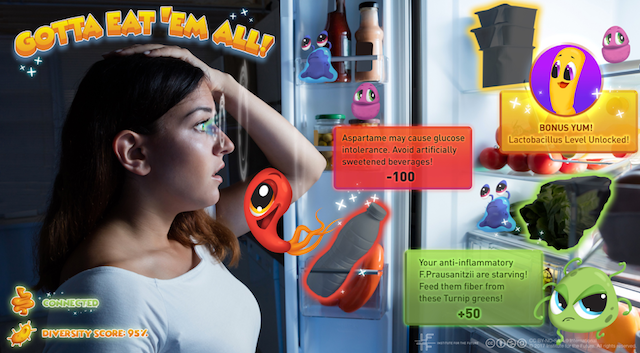 Check out this augmented reality microbiome diversity game called “Gotta ‘Eat Em All” – it could be coming to an app store near you by 2030! WHAT: Your microbial diversity score just hit the 95th percentile! Nice job! When you started playing “gotta eat ‘em all” you were only at 80 percent. An intestinal sensor transmits real-time information about your microbiome to the game, which then uses computer vision to identify foods–in your refrigerator, at the grocery store, or on a restaurant menu–that could help boost your gut health. The goal: maximize diversity. Every new microbe you “capture” in your gut adds to your score, and also helps build the world’s largest crowd-sourced database of microbiome data. This microbiome game craze has taken over cities around the world–kids in Singapore are begging to go hunt for rare microbiome-boosting foods at wet markets, and urban foraging teams in Seattle are mapping public fruit trees in search of polyphenols that help increase Bacteroidetes. Fermentation bars have opened up everywhere from Kyoto to Johannesburg with lines out the door for coveted krauts and misos. Prior to the launch of the game, the average person consumed just over 100 species. Now, the global average has jumped to over 500. SO WHAT: Low-cost genetic sequencing will enable direct-to-consumer microbiome testing, which will usher in an era of discoveries about the intimate connection between our diet, our gut microbes, and our health. Using this new wealth of data, game designers and citizen scientists can join forces to create engaging ways to help people maximize their microbial diversity. Not only will this result in measurable improvements in lifestyle diseases, but it will actually drive demand for diversified agricultural systems – even in those areas where industrial monocrops once reigned supreme. A primary key force hurting biodiversity is climate change. The 2018 report of the Lancet Countdown on health and climate change nicely outlines the complex interactions of what’s causing biodiversity loss and what happens because of it: Climate change results in ocean acidification, altered rainfall patterns, sea-level rise, and extreme weather. This then causes floods, heatwaves, droughts, and fires, which drive biodiversity loss, ecosystem collapse, and increases in pests. This leads to reduced agricultural productivity, loss of habitats, poverty, mass migration, and violent conflict. This isn’t just about the biodiverse food sources. This year, IFTF and Climate Investment Funds joined forces at the Global Climate Action Summit to forecast A New Story to Spark the Future of Climate Action. This vision explores a range of opportunities to take meaningful action against climate change (and thereby biodiversity loss). Climate change is only one of many forces that are leading to biodiversity loss. Others include increased adoption of large-scale industrial technologies and automation in agriculture and processing. These systems require plants and animals bred for standardization and optimized for transport. Consumer demands for consistent, always-available food drives genetically precarious situations, such as the ubiquity of the Cavendish bananas, the world’s most popular fruit, which is now facing extinction. However, there are still reasons to be optimistic. First is the move toward a more plant-based diet. A recent study in the journal Public Health Nutrition found that 2/3 of people reported eating less of at least one type of meat. Terms like “Reducetarian“, “Flexetarian“ and “Plant-Forward” are gaining traction around the world. According to the FAO, 33 percent of cropland around the world is used for livestock feed production. Reducing meat consumption could open up that land to grow crops other than corn and soy for animal feed. And for those who still want to eat meat, the development of cultured meat creates a new production platform for meat and could relieve many of the stressors put on our ecosystems from animal farming. A second reason for optimism is a growing recognition about the importance of soil health. 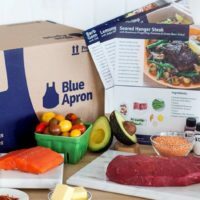 We’re seeing the food industry act on this with initiatives such as Annie’s Soil Matters Campaign and Blue Apron’s agroecology team, which provides a free soil-testing service and works with farmers to build its menus around crop rotations that support health soils. This marks a growing recognition that those who farm the land won’t be seen as the only ones responsible for its health; everyone across the supply chain, including food entrepreneurs and restaurateurs, will become soil stewards. Finally, we’re seeing the commercialization of a more diverse set of “ancient” grains in products like Rollin Greens tots made from millet. We’re also seeing the development of “new” grains, such as Long Root Ale, a partnership between Patagonia Provisions and Hopworks Brewery that uses the perennial grain, Kernza, developed by the Land Institute. SS: There are almost infinite cascading consequences of reduced biodiversity (perhaps most critically including bad tasting chocolate). That’s because biodiversity provides ecosystem services that have implications for social, political, economic, and environmental outcomes. A recent example of anticipating this web of consequences comes from the US Forest Service’s report led by David N. Bengston, Anticipating Cascading Change in Forests: Seeking a Deeper Understanding of the Future Consequences of Forest Management Action or Inaction. They used a tool called a “futures wheel” to start with a specific change and think through the second and third order consequences. In this case, one of the scenarios they play out starts with the premise that “central hardwood forests lack age class diversity and will uniformly grow old.” One of the consequence threads that came from this was: “(1st order) Decreased resilience to many types of future forest disturbance; (2nd order) More uncertainty for industry re: timber supply (declining forest-based industry); (3rd order). Declining quality of local school districts where mills are located because of reduced tax revenues.” The fact that the US Forest Service is now thinking about school district quality is an amazing example of how to think strategically and tangibly about the unintended consequences of something big and abstract like “diversity loss.” This can lead to better strategies to mitigate the worst effects, or even better – action to prevent them from happening in the first place. SS: The long-term business case for biodiverse food systems is simply that businesses won’t be able to operate in a future where our planet is destroyed due to human-caused climate catastrophes. The focus on short-term business cases is part of what has caused this problem to begin with by incentivizing mass consolidation, monocultures, and cheap, nutrient-void foods. Re-aligning business incentives to focus on biodiversity can provide some pragmatic, short-term benefits. 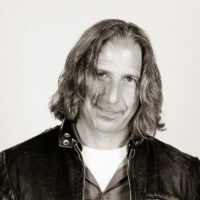 For example, fewer supply chain disruptions when you aren’t reliant on a select few sources; more flavor, which is the message behind Row 7 Seed Co, led by chef Dan Barber to develop and distribute plant varieties focusing first and foremost on deliciousness; or eliminating expensive and laborious hand-pollination for crops like vanilla by restoring natural pollinators. Emerging microbiome science is connecting the dots between low fiber diets and irreversible depletion of healthy gut bacteria – and the reverse seems to be true: eating high fiber, plant-rich diets underpins a healthy gut microbiome. However, rather than just focusing on the new market and profit opportunities that emerge from biodiversity, our strategies should also consider the harder-to-measure social and cultural impacts, such as strengthening identity, promoting culinary creativity, and nurturing a deeper appreciation of the connection between food and the land it comes from. What would it look like to design a food system based on the assumption that access to healthy food for our bodies and our planet is a right, not just a business case? SS: One investment strategy is to create cross-sector partnerships between government, philanthropy, and business in order to enable the food industry to take risks and transition to a more biodiverse future. My team at IFTF outlined specific strategies for how to do this in Good Food is Good Business, a report commissioned by the Bill and Melinda Gates Foundation about opportunities for the private sector to create affordable, delicious, nutritious, yet still profitable foods. Specifically, the chapter on “Traditional Wisdom,” which focuses on re-incorporating time-honored health practices and ingredients into food product development in order to make them more culturally appropriate and nutritious. One signal of change featured in our Good Food is Good Business report is the The Earth Bank of Codes, an open digital platform that aims to map the genetic sequences of all living things, apply AI and systems analytics for novel discoveries, and record the provenance of biological IP assets so that communities can benefit from scientific breakthroughs derived from their local resources. At the 2018 World Economic Forum in Davos, the bank announced a pilot project in the Amazon Basin to promote this new bio-based economic development path. Other incentives include creating new visibility for traditional ingredients, such as the Smart Food initiative at International Crops Research Institute for Semi-Arid Tropics (ICRISAT). They’re developing ways to make nutritious and drought-tolerant foods such as millet, sorghum, and grain legumes attractive again in Africa and India through projects like a reality TV show in Kenya that challenges contestants to incorporate these ingredients, and support for companies that make appealing foods with these ingredients. Anyone designing a menu or ingredient list is in a position to support biodiversity. For example, the Culinary Institute of America’s Menus of Change initiative sets a precedent for how to build an industry-wide movement to change what’s on the menu. This partnership with the Harvard school of public health creates guidelines to drive the food industry toward more plant-forward menus. 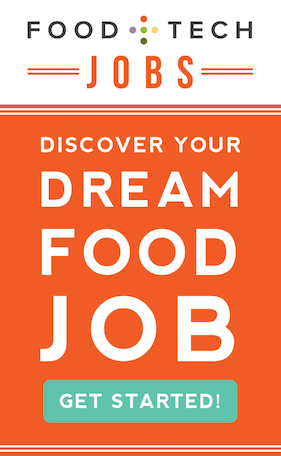 It has helped launch things like the Plant Forward 50 chefs list to really create a movement and impact behavior change. We can build on this momentum by not just promoting the consumption of plants over animals, but also promoting the consumption of MANY diverse plants and celebrating the delicious flavor benefits that come from this. We see chefs like Alex Atala and Gaston Acurio are already leading the way to promote local biodiversity on their menus. Chefs are also leading a movement to elevate under-loved fish and change diner’s palettes toward more sustainable options. In this way, chefs are wonderful, trusted matchmakers between taste preferences and new ingredients. Changing food standards and certifications is another way to incentivize biodiversity. For example, the EU LIFE Project “Biodiversity in Standards and Labels for the Food Industry” aims to support the industry in including biodiversity criteria in standards and label requirements, and encouraging food companies to consider biodiversity criteria in their sourcing guidelines. New standards and third-party certifications are popping up all the time. Including biodiversity requirements could go a long way to change industry practices. 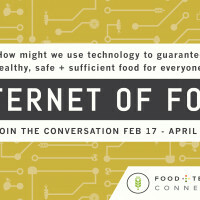 What, if any, exciting products, technologies or services are you seeing that support a more biodiverse food system? In addition to all of the signals of change already mentioned, I am particularly inspired by a few other creative projects related to biodiversity. Adaptive Farms, Resilient Tables is cookbook by the United Nations Development Program (UNDP), focusing on six regions around the world where climate change has already begun to exert pressure on agriculture. The book showcases recipes that support the resilience required to keep culinary traditions alive in the face of climate change, and it includes the personal stories of how people in those areas have coped with the changes. Artist Allie Wist’s seaweed-forward, experimental post-climate change menu immerses diners in a scenario about what it might be like to eat in a future of continued global warming and rising sea levels. Experiential futures like this are a fantastic way to help people tangibly understand the impacts of an abstract concept such as climate change or biodiversity loss. The Perennial Restaurant in San Francisco bakes their daily bread with Kernza, the perennial grain mentioned earlier, to support the shift from annual monocultures to perennial polycultures and educate diners in the process. Attempts by companies like JUST to catalogue the diversity of plants and use technology to better understand how novel plants can be used in food formulation, like their use of the mung bean to create their JUST scramble. SS: Promoting biodiversity is a shared responsibility. It will come about through the combination of new technologies, old agricultural techniques, and creative human collaborations and business models. As we all engage in creating a vision for a more biodiverse future it will be critical to optimize for values beyond efficiency, productivity, and yield, and instead optimize for values such as regeneration, inclusion, equity, and cultural resilience. Remember, just as we need diverse future food sources, we also need diverse visions of what those futures could look like in order to make sure we are considering all our options and building resilience. If you’re a food entrepreneur or a chef: seize your amazing platform to promote delicious, diverse foods. If you’re an eater (probably most of us): try to intentionally seek out more biodiversity in your diet. Eating Promiscuously not only allows us to experience a wider range of tastes and nutrition, but also to reexamine assumptions about how we feed ourselves and take care of our planet. Sarah is a researcher, writer, designer, and strategic foresight practitioner specializing the future of food and technology. She works with many of the world’s largest food, tech, health, and CPG companies to challenge assumptions and inspire new possibilities for the future of food. She uses creative visual and experience design to inspire food changemakers with the foresight necessary to understand complex systems and start making more resilient futures. Sarah is a frequent public speaker and workshop facilitator with both multinational executive teams and emerging food innovation entrepreneurs. She has been featured in National Geographic, The Washington Post, Vice Munchies, Business Insider, NPR, and many other food industry publications. She draws from her experience in a range of disciplines—international studies, graphic design, creative writing, permaculture, and the food service industry—to explore how emerging technologies and social practices will change the way people and communities seek and create well-being. Sarah holds a BA in International Studies and Visual Communication from Loyola University Chicago.